IT WAS FIFTY YEARS AGO TODAY! THE BEATLES: SGT. PEPPER & BEYOND examines the twelve months (Aug 1966-Aug 1967) that would arguably be the most crucial in the band’s career, a year in which they stopped being the world’s number one touring band and instead became the world’s most innovative recording artists, pushing the boundaries of what could be achieved in the studio. Unable to hear themselves perform and mired by controversy, the band decided to stop touring in August 1966. What followed was a period of extreme creativity and rebirth during which they embraced Swinging London, the ‘avant garde’, LSD and the advent of the Summer Of Love. The result was the creation of their new alter ego, Sgt. Pepper, with the desire to create a pop music first, the concept album. A devoted fan since the age of nine, the film’s director Alan G. Parker has set out to explore this period by filming interviews with former employees, fellow musicians, family member and journalists, all of whom were there at the time. These stories are in turn supported by a vast array of impressive archival footage, much of it not seen since first transmission. The result is a detailed examination of why the band stopped touring, how the album was conceived and its recording at EMI's Abbey Road Studios, its lyrics, the creation of its sleeve and finally its release. All this is set against a background of the band’s changing relationship with their manager, Brian Epstein and the tragedy of his death, the creation of Apple and the powerful influence of the Maharishi Mahesh Yogi. The lavish score featured in the film was composed by Andre Barreau (Sliding Doors, Dangerous Parking and Evan Jolly (co-composer The Crown/Hacksaw Ridge) and recorded in both London and Prague utilising The City Of Prague Philharmonic Orchestra. 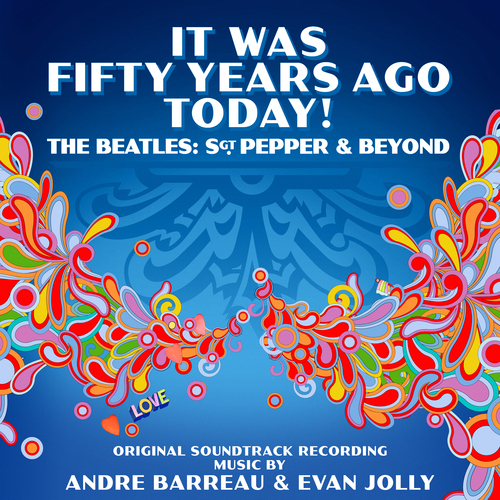 Andre Barreau - Fifty Years Ago Today!